Russian President Vladimir Putin has condemned the decision by the United States to impose a third round of sanctions upon Moscow, arguing that the measures are contrary to the interests of the U.S. The latest sanctions were announced on July 16 and target two Russian banks and energy companies Rosneft and Novatek. Sanctions are driving Russia-U.S. relations into a corner, Russian President Vladimir Putin said, following the imposition of a third wave of sanctions against Russia by the United States on July 16. Yet he told Russian journalists in Brasilia that the door was still open for negotiations with Washington. The new U.S. sanctions levied on Russia "disagree with the national interests of the United States itself," Putin opined. "The actions of the U.S. administration do harm to their own biggest companies," the Russian president stated, adding that Moscow would look into the sanctions without haste. "As to the sanctions, they regularly have a boomerang effect and, no doubt, will drive Russia-U.S. relations into a corner and do a lot of harm; I am confident they will be damaging to the long-term national interests of the American state and people," Putin told reporters on Thursday. Earlier, the U.S. Department of the Treasury imposed more sanctions on a number of Russian companies and individuals. The U.S. introduced sanctions that prohibit U.S. citizens from providing new financing to two Russian banks, Gazprombank and Vnesheconombank, and two Russian energy firms, Novatek and Rosneft, limiting their access to U.S. capital markets, a statement on the U.S. Department of the Treasury website reads. 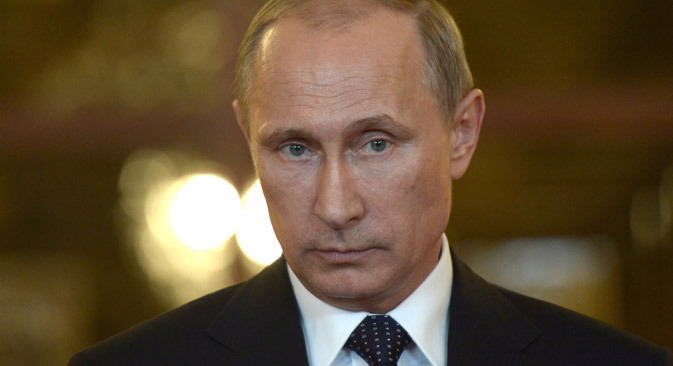 Putin said that he regretted that his U.S. partners had chosen this path. "But our door is still open for negotiations, to a search for a way out of this standoff. Hopefully common sense and the wish to resolve all problems by peaceful and diplomatic methods will win," Putin said. "For instance, big companies wish to work in Russia but certain restrictions will make them less competitive than energy companies from elsewhere in the world," Putin said. "We have given the largest U.S. [oil] company an opportunity to develop the shelf. Doesn't the U.S. want it to work there? It is damaging its own oil majors and for what? For making one mistake and insisting on making another?" Putin asked. He added that such policy was unprofessional, to say the least. "Sooner or later these methods of resolving international problems will have to change and the losses will be suffered by those who use them," Putin pointed out. The sanctions will also affect eight Russian armaments firms, including Almaz-Antey, the Bazalt Federal State Unitary Enterprise State Research and Production Enterprise, the Sozvezdie Concern, NPO Mashinostroyenia, the Kalashnikov Concern, the KBP Instrument Design Bureau, Radio-Electronic Technologies, and Uralvagonzavod. According to the statement, the companies "are responsible for the production of a range of materiel that includes small arms, mortar shells, and tanks." The prime minister of the self-proclaimed Donetsk People's Republic also fell under the U.S. sanctions for "threatening the peace, security, stability, sovereignty, and territorial integrity of Ukraine," the statement reads. According to the statement, The Department of the Treasury also designated Feodosiya Enterprises and four Russian government officials, including Sergei Beseda of the Federal Security Service (FSB), Russian Minister for Crimean Affairs Oleg Savelyov, State Duma Deputy Chairman Sergei Neverov, and Russian presidential aide Igor Shchyogolev. The European Union has also made the same move and brought its own sanctions against Russia “with a view to targeting entities, including from the Russian Federation, that are materially or financially supporting actions undermining or threatening Ukraine's sovereignty, territorial integrity and independence," conclusions adopted at the special meeting of the European Council read. The European Council also requested that the European Investment Bank suspend the signing of new financing operations in the Russian Federation. EU member states will also coordinate their positions within the EBRD Board of Directors with a view to also suspending financing of new operations, the conclusions read. "The European Council invites the Commission to reassess EU-Russia cooperation programs with a view to taking a decision, on a case by case basis, on the suspension of the implementation of EU bilateral and regional cooperation programs," the conclusions read. This however, according to them, will not affect projects dealing exclusively with cross-border cooperation and civil society.